Eurasian Hematology Summit is a joint project of Hematology Specialist Association and MD Anderson Cancer Center. MD Anderson Cancer Center doctors and scientists will present their latest research findings and perspectives on the hematologic diseases. 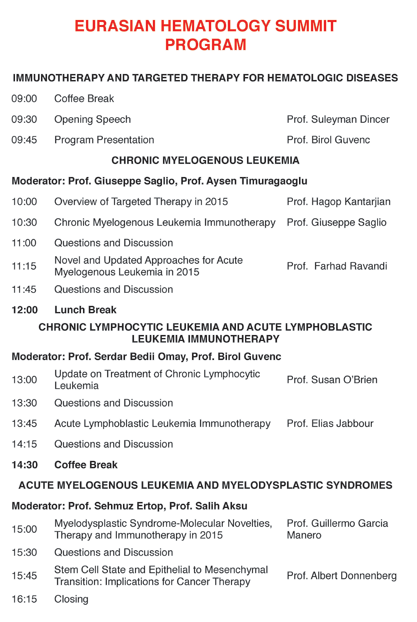 A One-Day Meeting will be held at the Hilton Istanbul Bosphorus hotel on Saturday 25 April 2015. Hematology Eurasian Forum has a limited capacity. It may therefore be necessary to restrict the number of delegates. Please send your applications as early as possible to sekreterlik@hematoloji.org.tr in order to assure your participation.